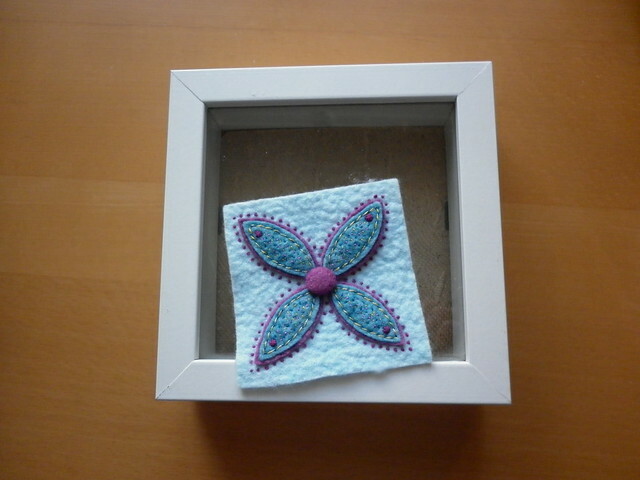 Thanks for popping in to see my entry in the Bloggers' Quilt Festival. 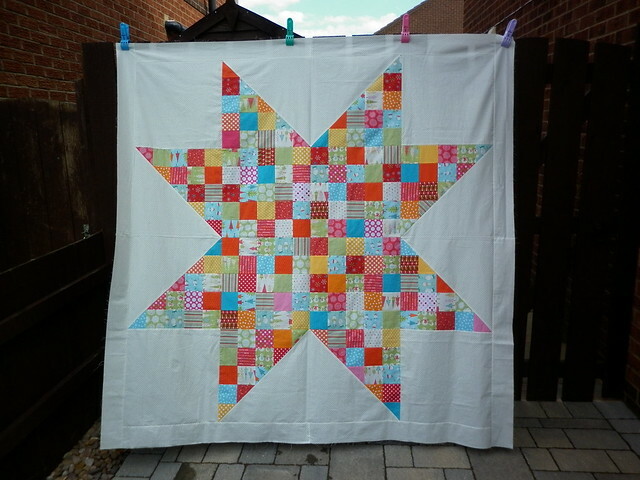 I haven't managed many finished quilts since the last festival (no surprise there!) and didn't think I'd be entering this time round, but Nicky reminded me about the mini category and so here I am! 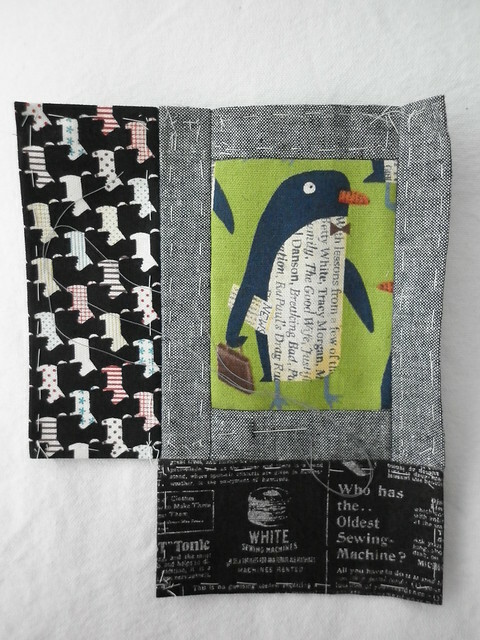 I made this little quilt, 'City Walk' (naming quilts isn't something I usually do but I felt that participating in a blog hop and designing a pattern for Oakshott warranted a quilt name!) 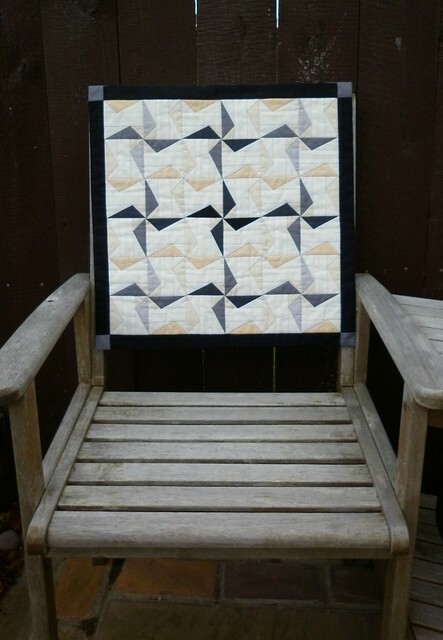 in July when I was part of an Oakshott blog hop and is designed around the traditional 'walking triangles' block. I wrote a rather ridiculously long tutorial for it as part of the blog hop and you can find that here, should you wish to make your own version. The quilt is made from a F8 bundle (plus a piece of wadding and a piece of fusible fleece) and I decided that I wanted to make something useful as well as decorative so this little quilt also doubles as a block roll (to keep pieces in the right place as you're piecing, going back and forth to the ironing board or taking your sewing to a friend's house) and will hang on the wall when not in use. 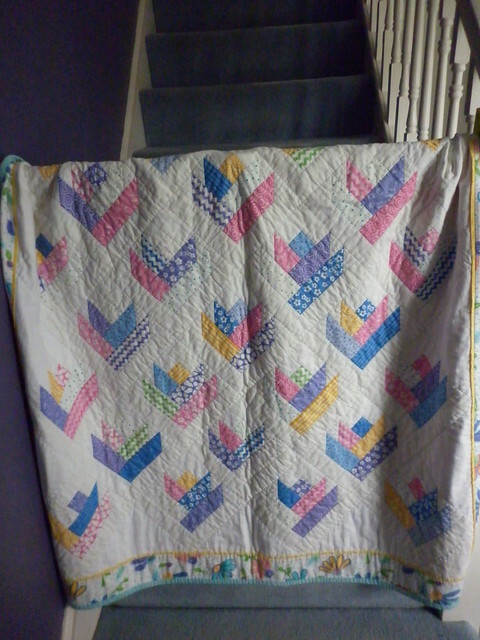 The quilt top is hand pieced (I draw round freezer paper templates to give me a sewing line, remove the templates, cut them out with an estimated quarter inch seam allowance and then hand piece using a running back stitch along the marked lines) and machine quilted (in the ditch). 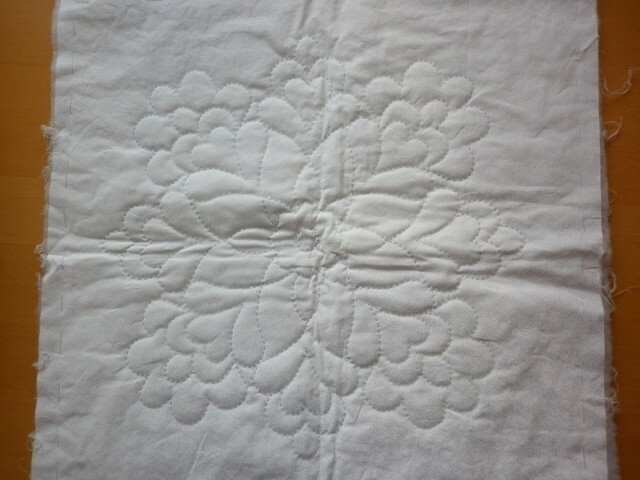 It is finished with a traditional knife-edge finish (rather than binding), which gives a nice sharp edge to a quilt. 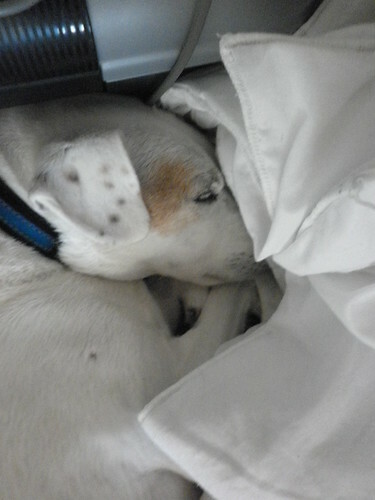 The quilt is 20" square, so just sneaks into the mini category. It has 224 pieces in the top (each block, consisting of four walking triangles, finishes at 6" square), including the borders and cornerstones and I must admit that I'm quite rather pleased with how it turned out! 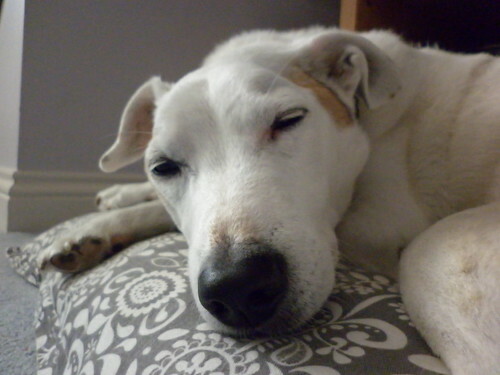 Thank you for taking the time to read this post (or just look at the photos! ), I'm off to see what everyone else has been up to! P.S. 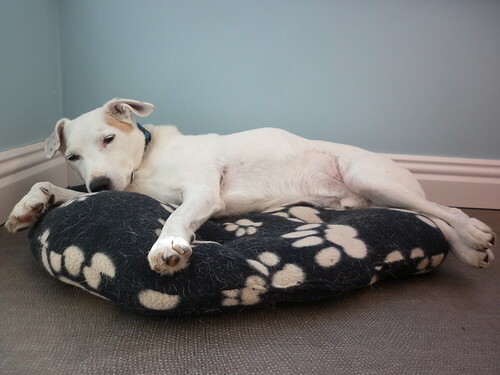 This may be my entry to the festival but it wouldn't be a blog post without some photos of Archie, would it?!! 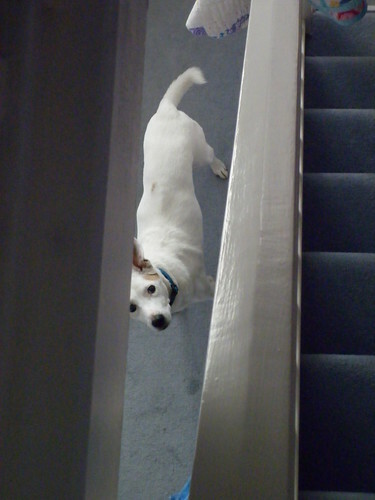 I'd like to come back downstairs now, if you don't mind. 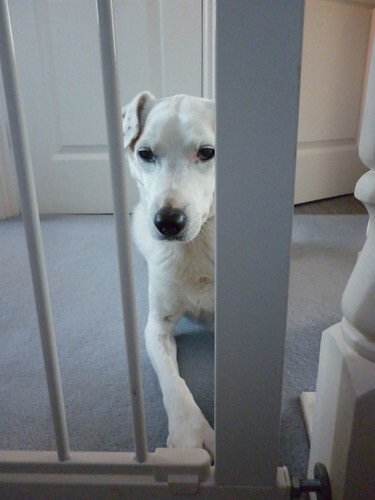 *sigh* Pleeeeeeeeeeeeeeease may I come down? 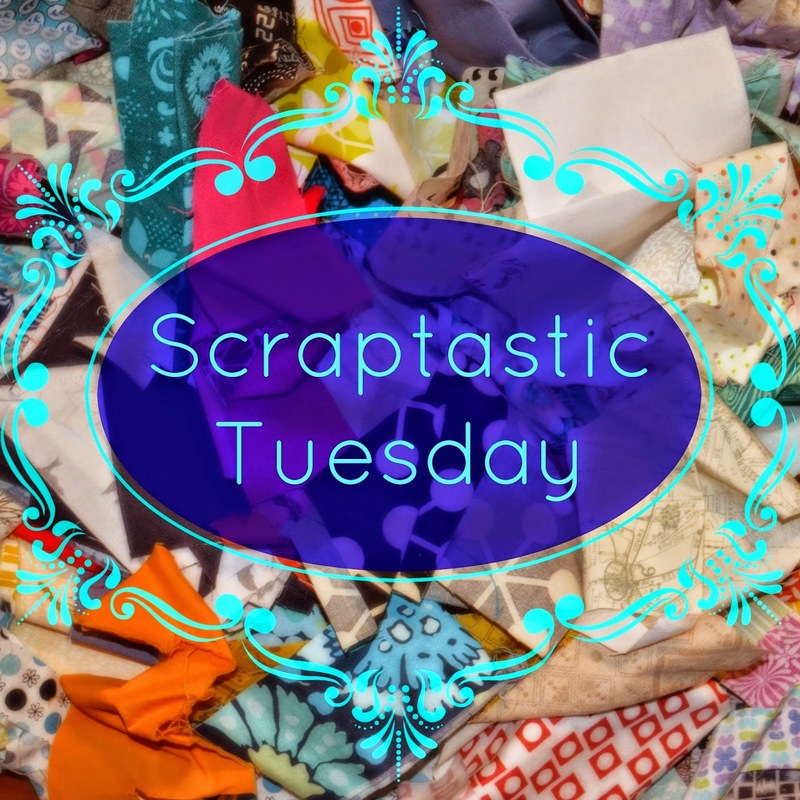 On the second Tuesday of each month, Nicky and Leanne are hosting a scrappy linky party, entitled 'Scraptastic Tuesday'. You can link up a blog post or Flickr photo (and possibly an Instagram photo but as I'm not on IG I'll leave that to the rest of you to work out!) about a scrappy project or scrap sorting system and you'll have a chance to win a prize from one of their sponsors. Why not join in? They've done something clever (I think it might be magic) with the linky party and you can link up to the same party from either of their blogs. This month you have two weeks to add your link. We're approaching the end of the current year with Bee A Brit Stingy (the second year of the bee and my first year as a proper bee) and our penultimate Queen Bee is Catherine, who chose scrappy blog cabin blocks as her block. 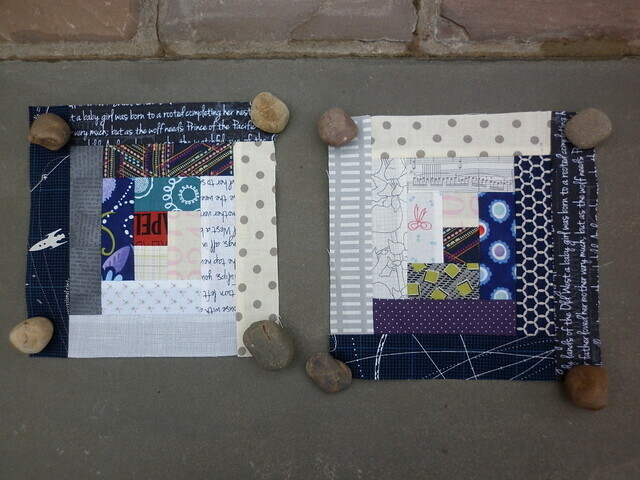 She asked for the blocks to be the classic dark and light log cabin blocks; two of the blocks needed to have a dark side made from bright and cheerful strips and the other block(s) needed to have a 'proper' dark (but not sludgy) side. 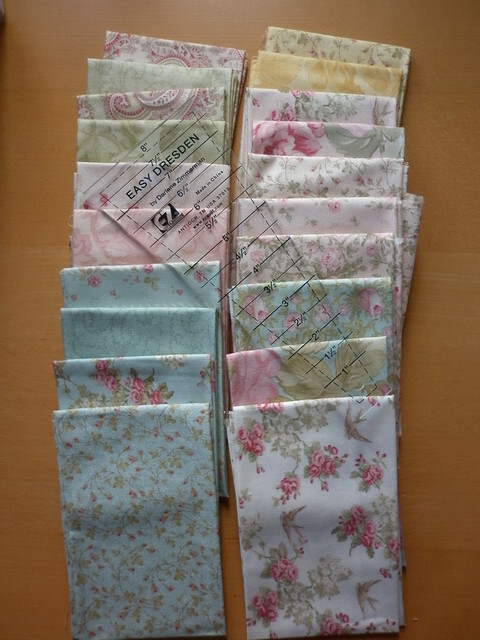 I had a lovely time in my sewing room yesterday afternoon and in just under two hours managed to make four blocks, all from fabric in my scrap boxes. My blocks are a smidge larger than they should be (7.625" unfinished, rather than 7.5") but I've left them that size and Catherine can trim 1/16" off each side if necessary! I made sure to include some space fabric I had in my box as Catherine is interested in astronomy and had fun choosing other fabrics to go in the mix, like the gold ladybirds (which, for some reason, feel like lucky ladybirds) and the cherry lips. 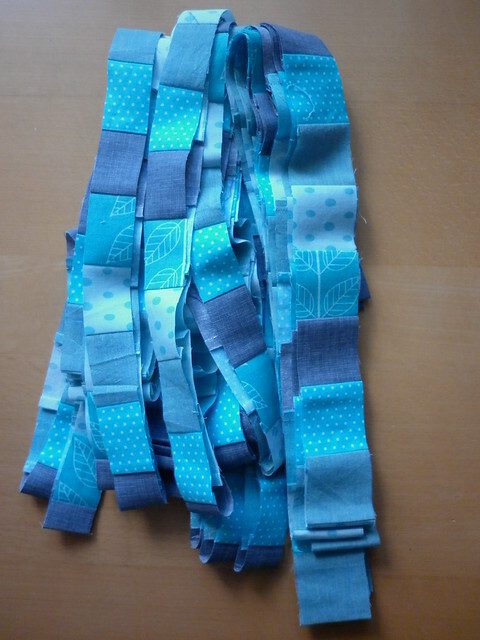 There's something very satisfying about making something completely from scraps, isn't there? Almost like you've made it for nothing! 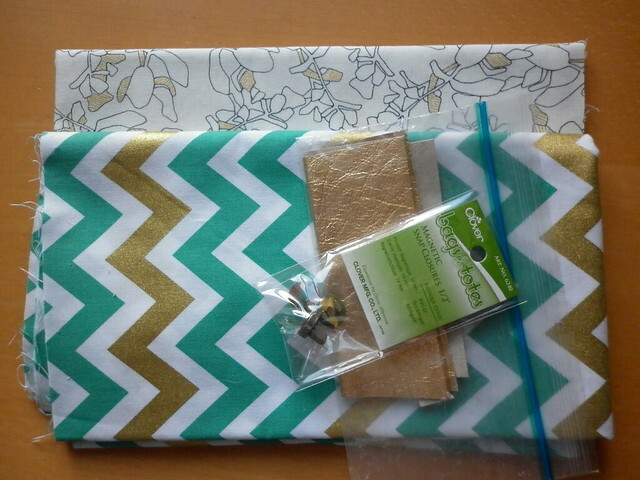 I'm going to be Queen Bee in November and have a scrappy block planned. 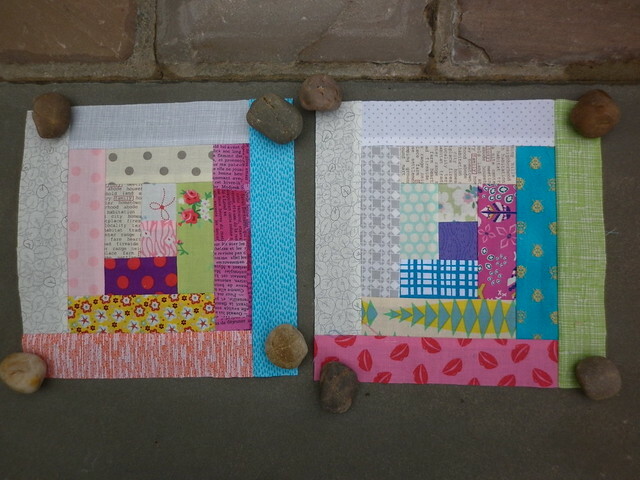 I really need to get moving and make my sample blocks and sort out a (very, very simple) tutorial. 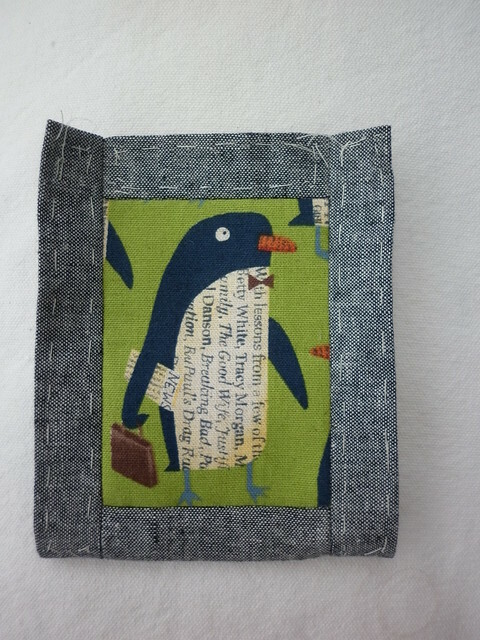 Mr Penguin, off to work (I like to think he's the penguin who founded the book publishing house and he's off for a hard day of reading at the office. Nearly all the walls added and it now makes a lovely (temporary) storage basket! Apologies for the night time photo! Where are you taking that? I was becoming quite fond of it! Quilt made from a Moda scrap bag and scraps of assorted white-on-white fabric - there's seems to be a theme to this blog post! 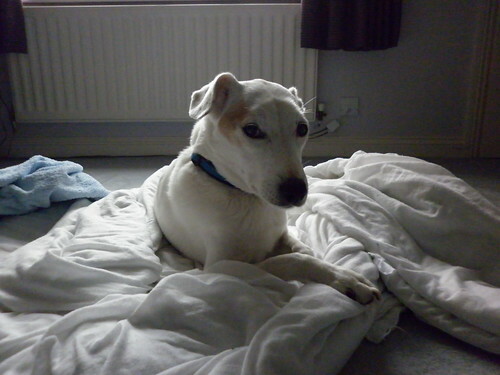 It presents a more solid barrier and Archie hasn't once tried to paw open the quilt! 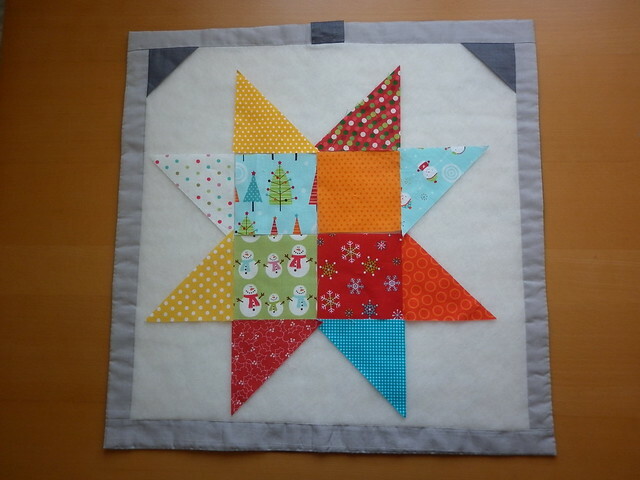 Isn't this little quilt gorgeous? 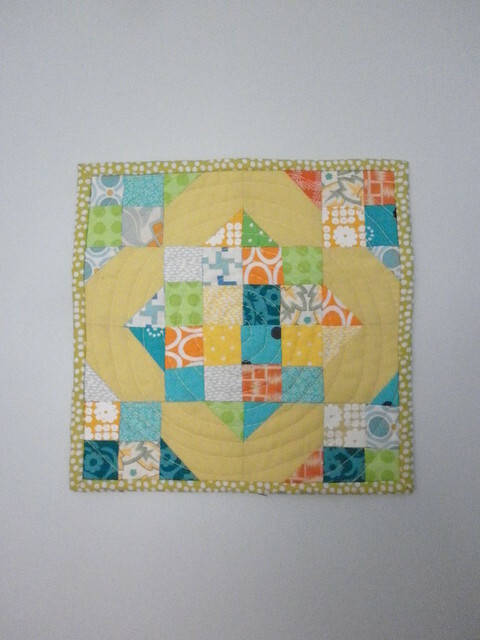 Catherine listed this little quilt in her Q4 FAL post and has sent it to me for my sewing room wall! 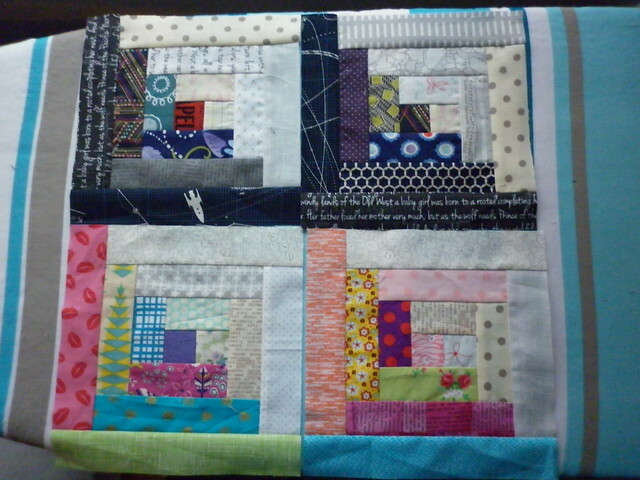 It has a little hanging loop on the back which is a great way to hang little quilts (and one I'll be remembering!). Thank you, Catherine, you're a treasure! Thanks for popping in - don't forget to link up to Scraptastic Tuesday and then have a nosy at what everyone else is doing with their scraps! I think I may have been visited by madness when compiling this list. For the last couple of months I've been adding projects as I thought about/remembered them and all of a sudden I seem to have the most enormous list of things I'd like to get finished. Fortunately, my natural realism has reasserted itself and I know I'm not going to get all of these finished in three months (or even half of them in double the time!) but I'm going to give it a good go! I'm in need of a new pin cushion and am going to make a larger version of the small EPP Japanese pin cushions I've made in the past. 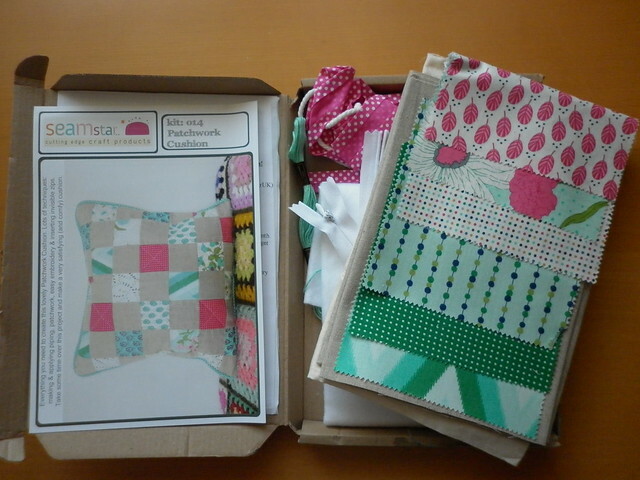 This would be a good evening project, I just need to bury my complete dislike of EPP for a fortnight or so!! This gorgeous fabric is going to become a Dresden plate which will then be turned into a little quilt for my sewing room wall - I think I'm going to add some embroidery around the edge (and possibly in the centre), if I can decide on the colours of thread and background! A friend gave me this kit for Christmas last year and I'd like to hang the decorations on the tree this year. If I just do a few minutes at a time then the skin on my hands will hopefully cope with the wool felt and I'll get them made! When I entered Katy's giveaway (in March this year), I promised that I would take Mr Fancy Pants Pouch on a trip to Whitby for an ice cream and a stagger up the 199 steps (followed by a very, very, very long rest at the top. And a cake. ); I need to get him made so I can keep my promise. 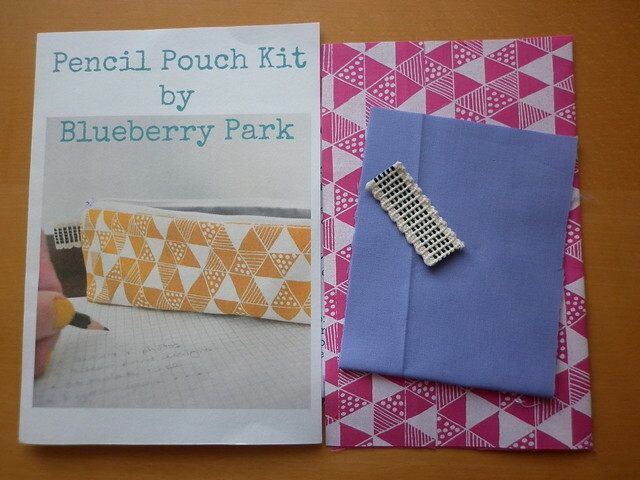 I won this gorgeous pencil case in Jan's giveaway (in September 2013) and I really need to make it, rather than admiring Karen's packaging and printed fabric! 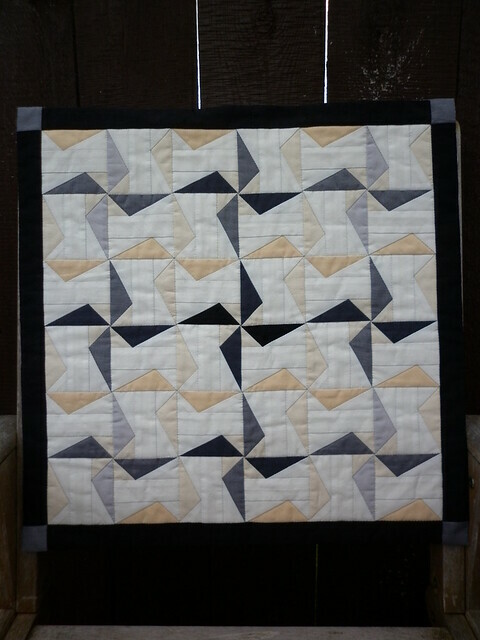 Hand quilted panel - this desperately needs a press! This is the first thing I quilted when I was learning to quilt with a hoop and two thimbles (before this I used neither but the pain got too much and it was either learn a new way of hand quilting or give up!) 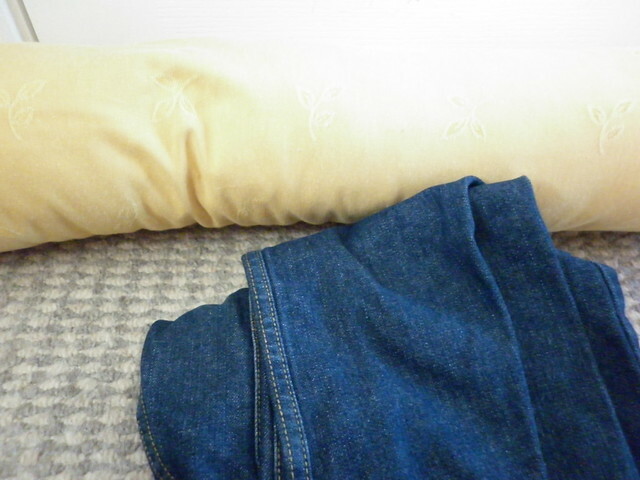 and is going to become a cushion, possibly with pale pink binding. ET block - Something else which is also desperate for a press! 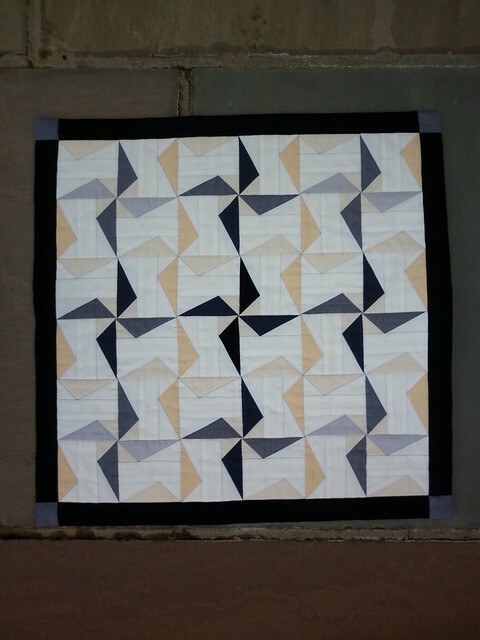 I made this test block before I committed to making a whole quilt of these wonderful ET block (designed by Lynne, pattern here) and then put it aside once the excitement of the 'real' project took over. 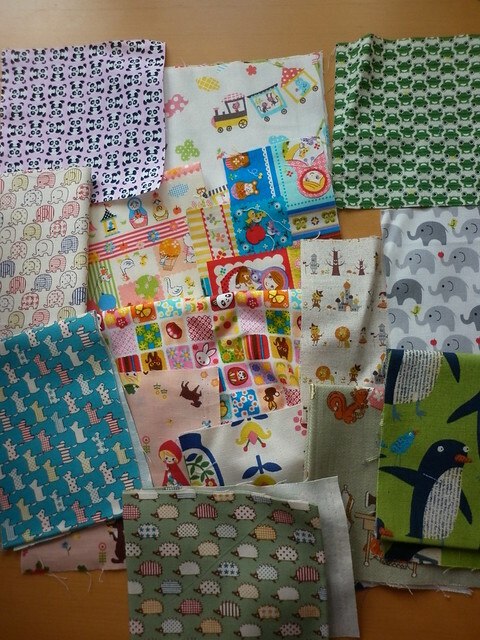 This is going to become a little quilt for my sewing room wall. Nicky kindly sent me the hardware to make my own clock and I thought these 10" squares would make lovely feature fabrics in a clock block. 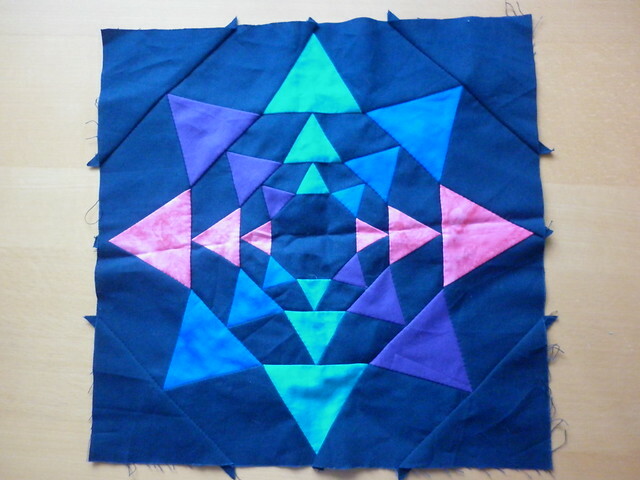 I have a block in mind (this hexy), I just need to scale it up and decide on fabric placement. 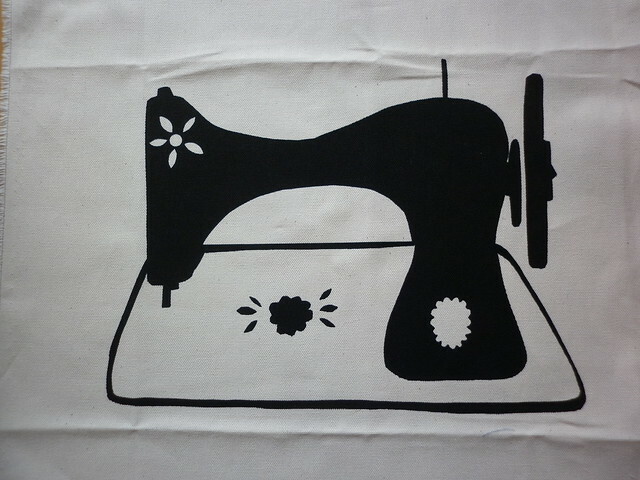 I'm the proud owner of a sewing machine print by Emily and I want to turn it into a little quilt for my sewing room wall (yes, I think this is the quarter of the little quilt!). I'm pondering adding some embroidery but I'm worried that might spoil it! This is a rollover from last quarter and has moved on, but only a little! It's going to be a cushion...eventually! I won this fabulous cushion cover kit from Seamstar when Kerry had a giveaway (in May this year) and now is the time to make it, I hope!! A few years ago (three? Four?) I bought this stunningly ugly draught excluder (the colour is far, far worse in real life!) with the intention of covering it before I used it. I've finally decided that denim would be the best fabric to use (my first choice was cord but that would be a nightmare with Archie's hair!) and I'm hoping that it won't take long to make. I helped Mam cover hers and it took about half an hour so if I factor in a little more time (to dismantle a jeans' leg) then an hour or so should see it finished. Provided I don't add any embellishment, that is! I started this canvaswork last week and have become more than slightly obsessed with it. 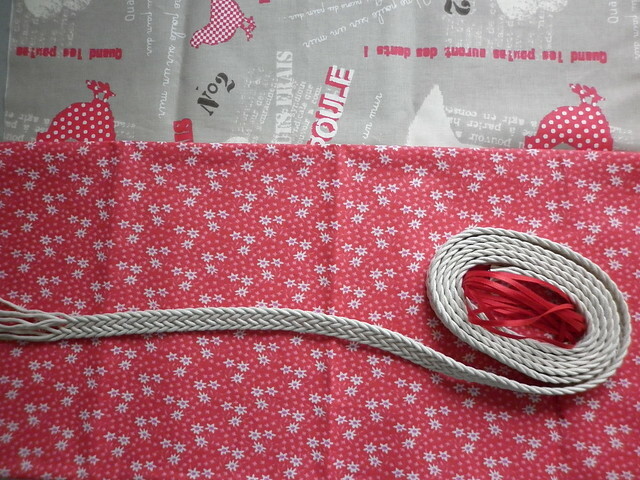 It's going to be a purse and could be finished in a relatively short amount of time, once I've decided on a zip colour! Another rollover! I stand a snowball in Hell's chance of finishing this before the quarter is up but I'm adding it to the (massive) list anyway. You never know, if we have a really cold winter then I may spend lots of time under this, hand quilting and watching Christmas films, while trying not to turn the heating on too often!! Now do you see what I meant about being touched with madness?! I wonder if I can just link up the same list for the five quarters..? Finally but most importantly, are you the lovely someone who bought me a surprise copy of 'Little Quilts' by Sarah Fielke and Amy Lobsiger? It arrived this week and I have no idea who it's from but I'd like to say thank you. You don't need to identify yourself if you don't want to (either here or by email!) but I wanted to let you know how thoughtful it was and what a brilliant book it is! In fact, I can see me being tempted to make several of the little quilts in the book rather than the little quilts on this list (don't tell Katy, she might tell me off. 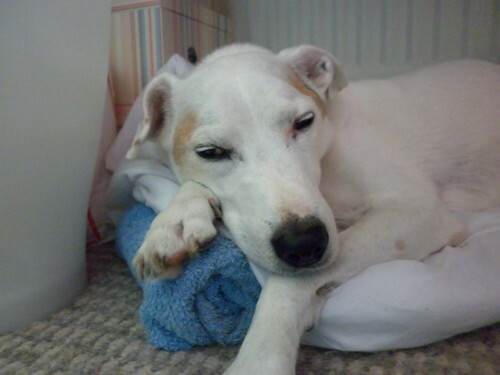 Don't tell Nicky, either, she'll definitely tell me off!!). Thank you, friend, you're a proper treasure!! I hope you're all having a good weekend. I must go, I've got a ridiculous FAL list to tackle! Thanks for popping in! This is my final finish for this quarter and is, once again, something small! 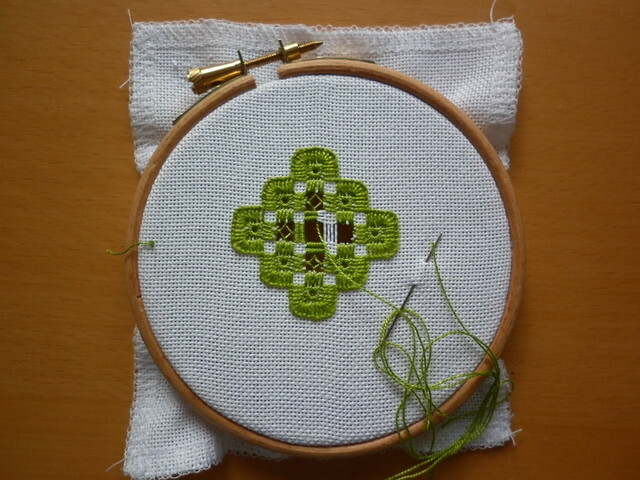 It's only a small piece of hardanger - that's a 4" hoop! By the end of July I had a finish, just not a blog post about that finish (no change there, then!) and, although it's only small, I do love it and can honestly say there's more work in it than you'd think to look at it!! It's a surprisingly hard thing to photograph and I completely forgot to take a photo of the hardanger before I stitched it onto the strawberry, so I'm afraid these photos will have to do! 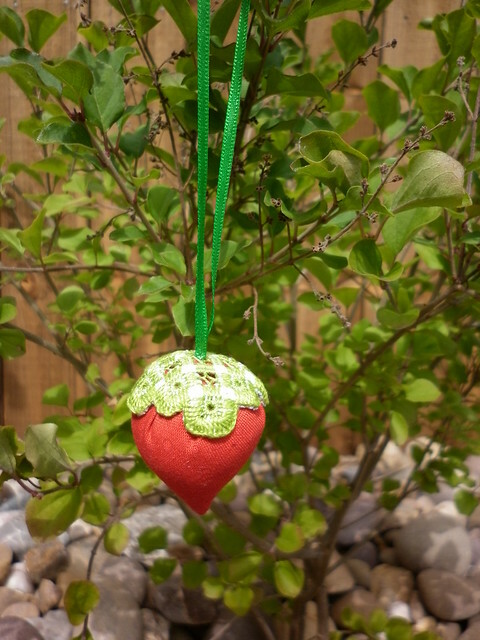 I think the strawberry is about 1.5" high and the hardanger is somewhere around 1.5" across its widest point - quite small but not so small that you need a magnifier to stitch it! It was stitched on 28 count evenweave, using Perle 8 and 12 in a lovely zingy green (I'm not sure of the number but it's probably equivalent to either DMC 704 or 907). 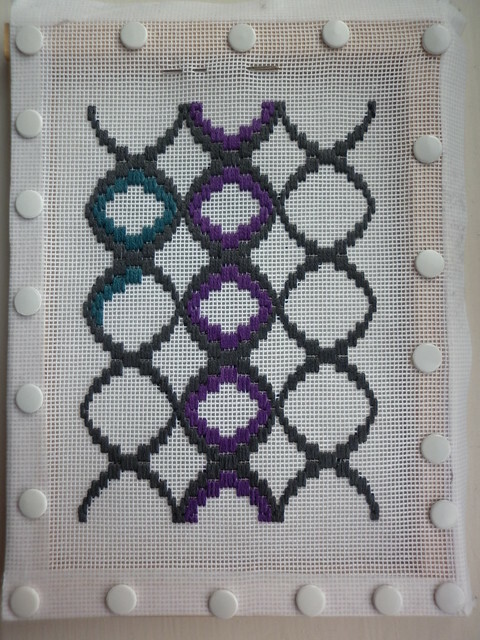 This may be my first piece of hardanger, but I don't think it's going to be my last and I may have to see if I can work a piece into a little quilt for my sewing room wall. I seem to have started another piece of embroidery and I'm slightly obsessed with stitching it can't put it down! I started it yesterday (at a class run by my magnificent friend Beryl of Knot - read in the right (or perhaps, wrong) way, I think that sounds like a marvellous title to have!)) and, because my (right) hand/wrist was already sore before I started (I think all the typing for my recent flourish of blog posts has aggravated my tendonitis/tennis elbow/whatever the hell it is) and was even worse after a couple of minutes, I've decided to stitch this with my left hand. I'm not very right-handed (I was 'undecided' by the time I started school and may well have been left-handed if I'd been left to my own devices) - there are things I do right-handed (crochet, knitting, writing), things I can only do left-handed (peeling and chopping, eating, spreading butter, etc. I've just realised that they're mainly food-related!) and things I do with either hand, depending on which is closest/free!) so I have relatively good fine motor skills in my non-writing hand and the only difference in my stitching is that it's ever so slightly slower than usual! 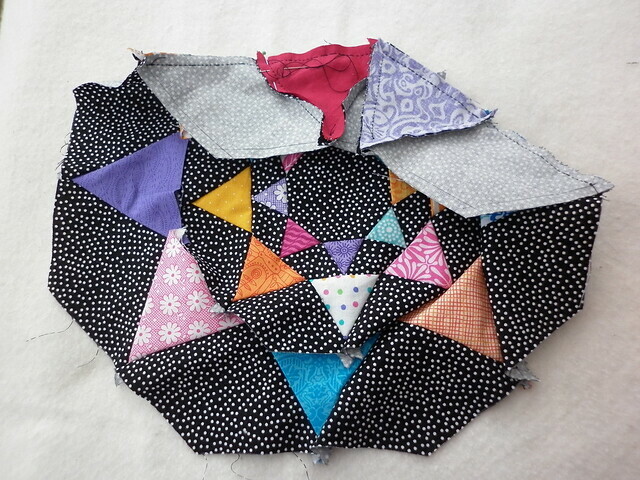 This is going to become a little zip purse and will probably appear on my Q4 list! 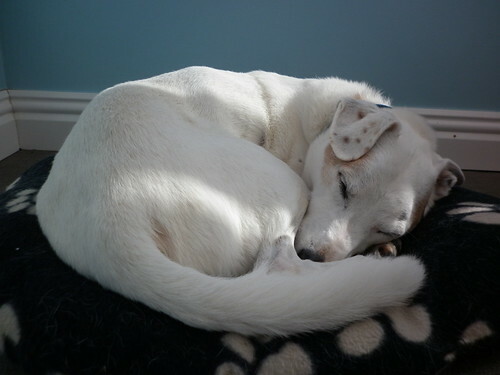 I hope you enjoy the rest of the weekend and that the sun is shining down on you and warming your bones. 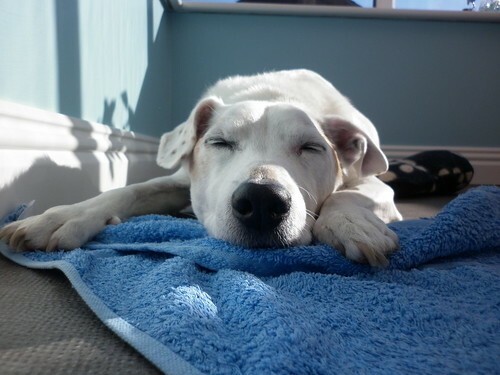 Archie thinks everyone needs to warm their bones as much as possible and that if you see a patch of sunshine you are morally obliged to lie down in it so you'd best do as he commands. I used this as another distraction activity while Archie was poorly but again I couldn't be away from him for long as the whines were really quite mournful and he kept getting distressed. I'd like to blame this for a certain 'design feature' inside the bag...you'll see what I mean in a moment! I decided to keep the bag as simple as possible, just a straightforward tote bag for carrying parcels to the post office, etc. 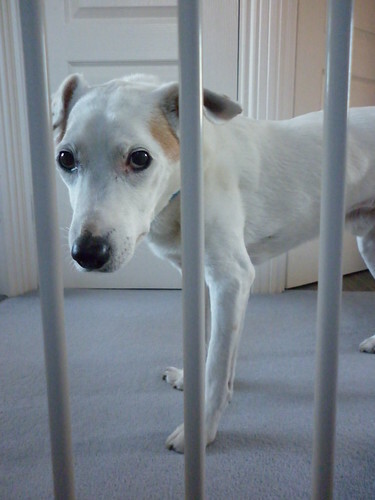 and so I kept nipping upstairs to cut fabric or sew a seam, in between sitting in front of Archie's cage and reassuring him that everything was okay. 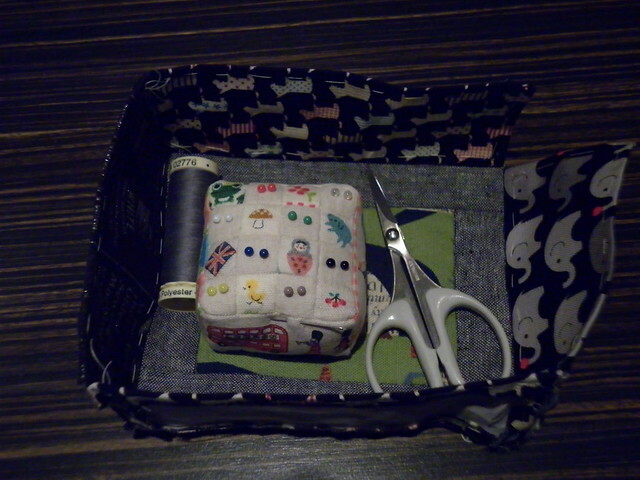 After an afternoon of nipping, stitching and unpicking (that sounds like a sewing class in an infant class, doesn't it?!) I had a bag! When I put the inside and outside together, ready to join them, I discovered that there was no way they were going to fit together. 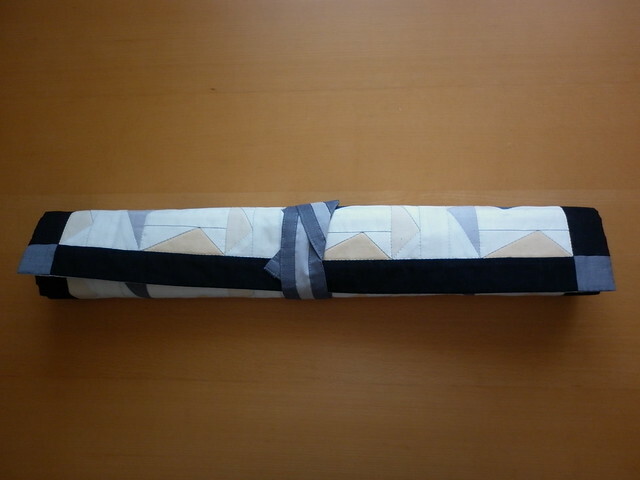 After some investigation, it turned out that the lining was 2" narrower than the outside. Ah. I didn't have a large enough strip of the lining fabric left (ironically I'd cut a 2" strip off the lining and wondered why I was trimming so much more lining than outer!) so had to sort through my stash and scraps to find something to make up the difference. Thankfully, Nicky must have known that at some point I'd need a cream, tan and brown fabric and had sent me a strip of the perfect fabric - it feels like it's from Art Gallery Fabrics but I have no idea of the name. It's not AGF but a Japanese fabric from Kei, available from PolkaDotTeaFabrics. I used a red polyester thread from Empress Mills, which I won a couple of years ago from Alison, to sew the lining and it was a great colour match as well as lovely to stitch with. 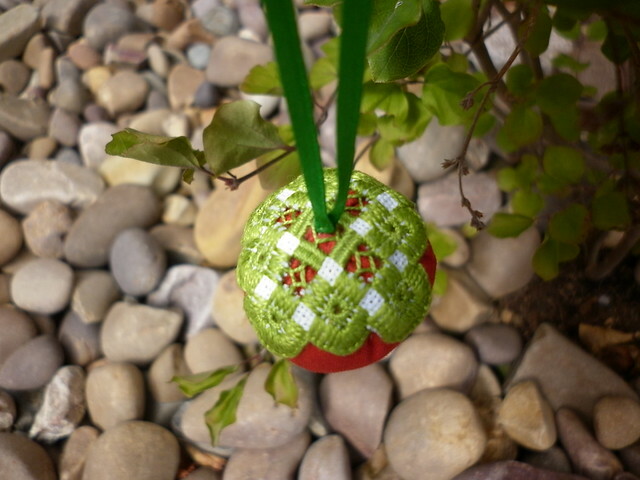 I used an Aurifil 50wt (5011) for the outside, again it just happened to be a perfect colour match. Isn't it nice when you have the thread you need already in your thread box?! I would usually use a polyester thread or heavier cotton thread for top stitching on bags but I didn't have anything in the right colour so decided to stitch extra lines, both for strength and to also add a bit more interest. I stitched either side of the seams on the side and bottom of the bag and on the other side, where there isn't a seam, I stitched a line along the fold and then either side of it, mirroring the other side. It took a bit more time than simply joining along the seams but it adds a nice touch and also means the seams sit nice and flat; I'd definitely do this again. 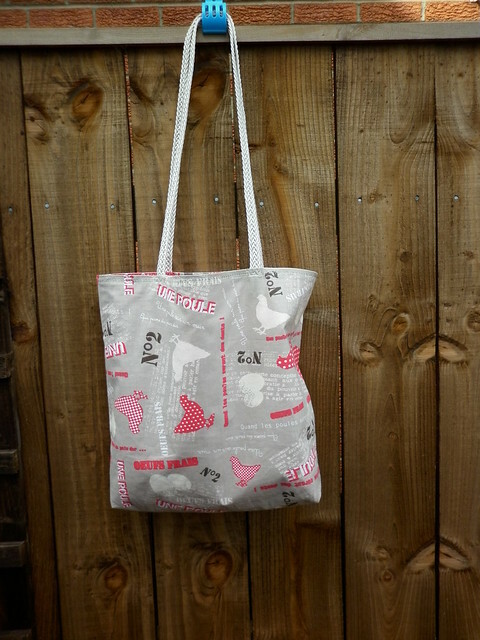 Rather than simply top stitching a straight line round the top of the bag, I used the feather stitch on my machine. It got a bit closer together as I stitched over the bulky handles but I can live with it! Since I finished it, this bag has become my favourite one for taking to the shops or carrying presents to friends' houses, etc. and I think it's all to do with the handles: long enough to carry the bag on my shoulder but comfortable to hold in my hand, narrow enough to not feel in the way but wide enough to feel sturdy. I've never seen this trim before but if I ever do see some, I'll be investing in a few metres of it! 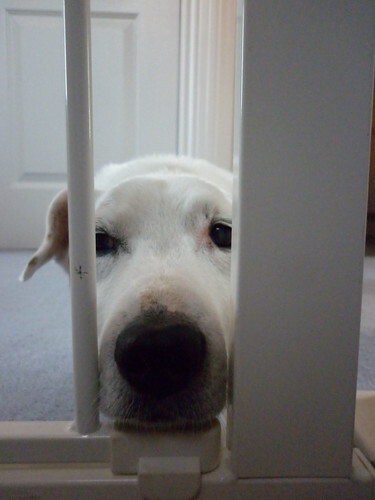 What are you doing up there? And why can't I join you? Please come back! 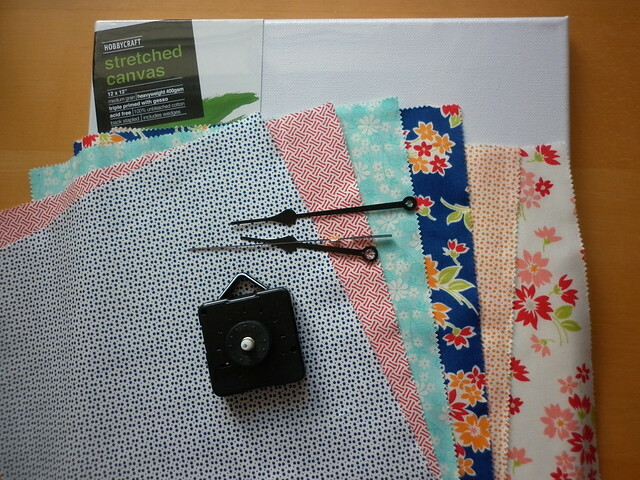 So, instead of some machine piecing, I'm going to return to a project that I have decided to become reacquainted with. I haven't touched it in months (probably not since the start of the year or even the end of last year!) and I now have more than a touch of the 'can't put it down's for it. I think that's partly because I've adopted a different stitching sequence (I'll explain more in another post, if anyone's interested), which makes it feel less 'bitty'. I have the final round to finish adding and then I'll have made two blocks (out of thirty-five, if I remember correctly) and I'll then need to prepare another block. I have lots (and lots!) of triangles already prepped, it's just the background pieces that I need to sort out, plus any extra triangles I need to make the colours/scrappiness work. I think I have one more finish post to go and then I'm caught up. After that, I'll see if I can sort some posts about things I've been doing which aren't on my FAL list (the garden, my Summersville project and some lovely prizes I've won in recent weeks) and then I'll be completely caught up. That'll make a nice change, I wonder how long it'll last! Thanks for popping in, I hope your week is ending on a high note! P.S. For the attention of Jenny Larking and DianneO! You left lovely comments on one of my previous posts but you are both 'no-reply bloggers' and so I can't reply to your comment via email! You may be inadvertently missing out on replies to comments, prizes from giveaways, etc. due to this so please click on this link and add an email address to your account! Thank you!